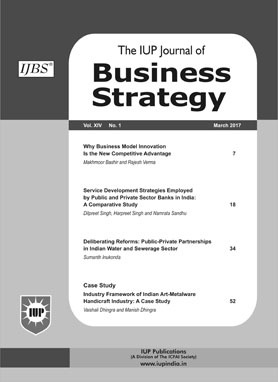 It is a quarterly journal that focuses on Business models; Entrepreneurship, creativity and innovation; Change management, Operational excellence, Leadership, Turnaround strategies and Mergers & acquisitions. Also deals with Innovations in Corporate Structure for better results, Competition management strategies, etc. Leadership in public sector is critical to good public governance for transforming India into a high growth and inclusive economy. Having made the best choice in selecting the CEO by eliminating type one error, the question arises as to how we address the risks arising from principal agent problem. This paper explores various country models for performance management, analyzes the current system, advocates for fixed tenure, mentoring and training and recommends performance metrics. A detailed examination of public sector MOU system is carried out with its promises and pitfalls. Considering the importance of due processes in public sector in addition to achieving results, this paper advocates adoption of GRI reporting standard and SA 8000 for measuring the social impact. The paper elucidates that the exit of CEO from the system needs equal attention, when he/she fails in either performance delivery or adherence to values. Finally, the paper recommends key ideas for change with some best practices for getting the best out of the CEO. In the recent times, the issue of environmental protection and sustainable development has received increased attention all over the globe. Now, industries are also increasingly realizing their role in environmental protection and sustainable development. As in other parts of India, the growth of industries in Assam has also been guided by the necessity of increasing production. For protection of environment and sustainable development, different industries of Assam are committed to abide by the environmental norms and various conditions stipulated by the Government of India. This paper is an attempt to analyze the environmental protection performance by the major industrial units of Assam. It has been observed that out of the 25 sample companies under 10 industry groups in Assam, 21 (84%) companies disclosed their environmental information. However, almost all the sample companies disclosed some information on steps taken towards environmental protection. The study observed a very strong positive correlation between the size of firms and the level of corporate environmental disclosure among the major industries in Assam. The findings revealed that there is a need for proper guidelines and framework for environmental performance by the industries in Assam. Developing countries and even some developed countries face financial constraints in building the country's infrastructure. Public-private partnership (PPP) appears to be an adequate mechanism for empowering both developing and developed countries to bring together the strengths of public and private sectors to build infrastructure projects. Given the state of affairs of India's transportation sector in general and road sector in particular, PPP may be one of the most preferred solutions. After the introduction of PPP, there was an exponential growth of 69.43% in the length of the National Highways in the 9th Five-Year Plan. But thereafter, the growth subsided-14.59% in the 10th Plan (2002-07) and 15.36% in the 11th Plan (2007-12). The number of projects awarded to PPP decreased sharply. This paper aims to investigate the factors critical to the success of PPP in the development of the road sector. The paper analyzes the views of one stakeholder-Private Developer (Concessionaire). The study is motivated by the country's inability to use PPP to the extent required in the development of the road sector. A questionnaire with a list of 26 critical success factors of PPP, identified through literature review and through discussions with experts, was administered among respondents experienced in development of road projects through PPP mode. The questionnaire was tested for its reliability using Cronbach's Alpha. The data was analyzed using relevant statistical tools. The top five factors identified were-sufficient financial viability, appropriate dispute resolution mechanism, favorable government policy measures, long-term low interest rate finance and suitable adjustment formula for toll revenue. The current study is aimed at validating the past literature which states that increased market orientation has a positive impact on the performance of Micro, Small and Medium Enterprises (MSMEs). Preliminary statistical review indicated that the performance potential of the MSMEs has not been met in India. A review of the literature further indicated that one of the ways by which MSMEs could increase their performance was by increasing their market orientation. However, not much study has been done in India to see the relationship between market orientation and firm performance of MSMEs. The current study is planned to fill this gap via studying the relationship between market orientation and the performance of Indian MSMEs. Panel data was retrieved from the Prowess for a period of six years from 2012 to 2017, and the data was analyzed using EViews panel regression model with random effects model. There were three main findings of the study. First, the results of the study indicated that market orientation had a positive effect on business performance. Second, beta values indicated that the market orientation-performance relationship was stronger in manufacturing firms than in service firms. Third, a simple linear regression was performed for six years to check how beta value had changed over the years. The beta values increased gradually from 2012 to 2017 for both Manufacturing and Service Firms, indicating that Indian MSMEs understood the importance of market orientation and its implementation.